Sadly I can’t say new in box but these were worn from the house to the car once and that it. My loss is your gain. From a smoke free pet free home. MICHAEL KORS WHITE VIOLET SANDAL HEELS NEW WITH BOX HALF OFF RETAIL 8.5. Condition is New with box. Shipped with USPS Priority Mail. CONDITION: Great! See photos. COLOR: Black. These are pre-owned and in excellent condition. No visible marks or snags. 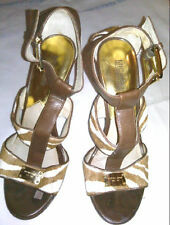 Brand New, No Box, NEVER WORN Womens Shoes Michael Kors Open Toe Sandals Cork Heels Brown/Tan Size 8.5 . Retails for $220.00 No wear on the bottom. Condition: New without box/ Perfect but marker spot on bottom sole of shoe. Content: Genuine Leather Upper/Wood/Man-Made Sole. Smoke-free facility. Suede has no marks, no stains, no scratches. Heels in like new condition with no visible signs of wear. Interior and soles clean. Gold tone strap buckle. Leather soles in Great Condition. See photos. Simone Mid. Style: Ankle Strap Sandals. Color: Tan. These are beautiful shoes. Plum soft leather ankle strap platform shoes. Black soles and heels. Buckle on side. I loved these Sandals, These are very cute and look great with denim wear. I have shoes and bags for many likes and tastes. MICHAEL KORS Womens Brown Leather STILETTOS PLATFORM Heels size 8.5M WOW!!! Offered for sale is a pair of Michael Kors women’s brown leather stiletto platform heels with a gold buckle size 8.5 medium. These shoes are in excellent preowned condition: see photos. After close inspection of these shoes I cannot find any notable flaws. These are preowned shoes and they do show general signs of wear/usage: see photos. If you purchase these shoes I will pack them safely and ship them within 24 hours. They will ship via USPS priority mail. Thank you for your consideration. SANDALS HEELS. Pre-owned in very good condition with normal signs of wear, scuffed platform at the front(see pictures). Platform: 1". Leather Upper. Color - Brown. Insole Length: 10". 100 % authentic ! This item is in pre-owned condition and shows wear from previous use, including heel scratches & marks, scuffs, surface marks and outsole wear. This is a USED item donated to Goodwill of Silicon Valley. Display Model Shoes have minor scuffs, soiling from being tried on and displayed. Scuffs on heels, light scuffs on buckle. Shaft Height w/out heel With that they may have light scuffs, scratches, or soil from being tried on to being lightly worn. So put us in your favorites. Good with almost no wear. Display Model Shoes have minor scuffs, soiling from being tried on and displayed. Scuffs on heels. Shaft Height w/out heel With that they may have light scuffs, scratches, or soil from being tried on to being lightly worn. The low heel provides comfort while the snakelike print and gold tone help bring it to the next level. Don't like them?. Send them back! Removeable insoles=no. Embossed leather. These shoes are in very good pre-owned condition. Cushioned footbed. Gold triple functional buckle detail with each buckle being 3-way adjustable. Zippered heel in gold. Gold wedges with ankle wrap.